If you live anywhere near the Atlantic or Gulf coasts you could be susceptible to the impacts of a hurricane. The Atlantic hurricane season officially runs from June 1 to November 30 although hurricanes can occur outside that time period. Outside the hurricane season the impacts of a strong nor’easter can be just as devastating. Are you prepared if a large storm is headed your way? Do you know what to do? The National Weather Service and theNational Hurricane Center are valuable resources for everything hurricane related. They offer some valuable checklists for hurricane season. Take pets with you if possible, but remember, most public shelters do not allow pets other than those used by used by people with disabilities. Identify pet-friendly hotels along your evacuation route. Be prepared for the unexpected. What if you and your family aren’t together when a storm hits? How will you find each other? Will you know if your children or parents are safe? You may be forced to evacuate or you may be confined to your home. Do you know what to do if water, gas, electricity or phone services are shut off? If you get caught in the impact zone of a major hurricane you may not have electricity for weeks. When a storm hits things will be chaotic. Some planning ahead of time will help alleviate some of the stress. Gather contact information like the local phone number for Red Cross and FEMA. Make copies of important documents such as insurance policies, mortgage, bank account information, wills, etc. and keep them in a readily available location. 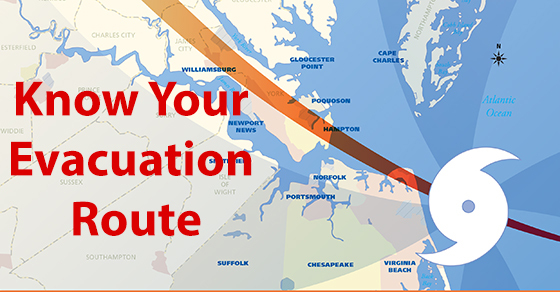 Know the suggested evacuation routes and review them for yourself. Always have a Plan B (Plan C and D don’t hurt either). Develop an emergency plan with your family and if it needs to be implemented, follow it as planned. Part of your plan should include an emergency supply kit. Hurricanes and major storms can be concerning, but planning ahead will do the most to minimize the chaos that follows. Being prepared provides a calming effect because you know you have done everything you can to keep your family safe during a time of crisis. Following the guidance provided will go a long way towards reducing the impact to you and your loved ones. To get more information on property management go tohttp://www.tidewater.realpropertymgt.com.